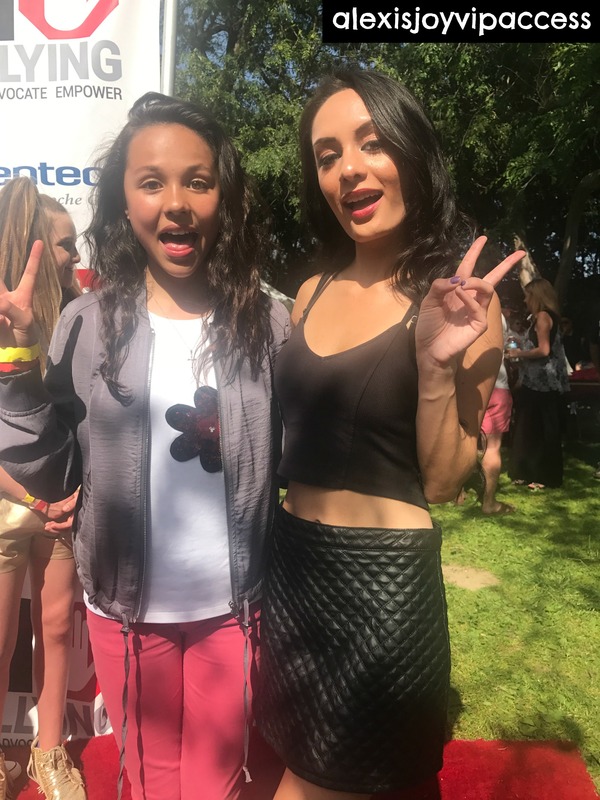 VIPAccessEXCLUSIVE: The Marvelous Breanna Yde Interview With Alexisjoyvipaccess At The 2nd Annual Say No Bullying Festival! Breanna Yde – words fall short when talking about just how incredible and extraordinary this young lady is. The wonderful Breanna Yde defines what it is like to be a multi-threat. This brilliant actress has had us all jamming out and enjoying all of the musical fun in the highly-acclaimed and top-ranked Nickelodeon show, School of Rock. In each and every episode, Breanna Yde’s indescribable and impeccable talent always shines and we love seeing her combine her two passions together: both singing and acting in the fan-favorite show. In addition to School of Rock, Breanna Yde has exhibited her stellar talent in many other renowned projects. She’s starred in Nickelodeon’s The Haunted Hathaways, as well as the movie, Santa Hunters and we can’t wait to see Breanna in the much anticipated, new Nickelodeon movie, Escape From Mr. Lemoncello’s Library. Breanna proves that she excels in both on-screen acting and voice-acting as she voiced the role of Ronnie Anne in The Loud House and the role of Molly in the animated movie, Albert. Aside from being a profound and exceptional actress, Breanna Yde is also known for being one outstanding singer as well. In addition to showcasing her singing talent on School of Rock, Breanna has also shared many marvelous covers that we all love listening to over and over again. Breanna has one of the most harmonious and angelic singing voices and she always mesmerizes everyone with her wonderful singing and acting gift. Breanna Yde continues to have a great amount of well-deserved successes – from just recently appearing in an episode of The Ellen DeGeneres Show, to being nominated at the 2017 Nickelodeon Kids’ Choice Awards, and sharing many excellent Musical.ly posts that always go viral. Breanna Yde is such a spectacular role model to all of her fans and she is someone that can always brighten up everyone’s day. She truly deserves all of her successes and there is only more coming for someone as stupendous as Breanna Yde is. I, Alexisjoyvipaccess had a fantastic time covering the 2nd Annual Say No Bullying Festival and had a terrific time catching up with and interviewing the radiant and dazzling Breanna Yde again at the event. Breanna Yde dished exclusively to Alexisjoyvipaccess all about what are some of her pre-show rituals before a performance, what it was like for her to appear on The Ellen DeGeneres Show, which character from School of Rock she would like to swap lives with for a day and so much more only in our VIPAccessEXCLUSIVE updated interview. Breanna Yde even sent out some awesome advice to all of her fans on how they can help put an end to bullying – hear what she had to say in our VIPAccessEXCLUSIVE updated interview below. Thanks for another fun interview, Breanna – always a blast chatting with you! Check out my VIPAccessEXCLUSIVE updated interview with the magnificent Breanna Yde at the 2nd Annual Say No Bullying Festival below! Previous VIPAccessEXCLUSIVE: JoJo Siwa Interview With Alexisjoyvipaccess At The 2nd Annual Say No Bullying Festival! Next Article: Larsen Thompson Was The Queen Of Coachella – Check Out A Recap Of Her Fun Time Here!